With a consistent scoreline across three races today (1-3-2), Emirates Team New Zealand now lead the Camper Regatta - Conde de Godó Trophy - Barcelona. Madrid - Caser Seguros scored an almost perfect day (1-2-1), and keeps a solid leadership in GP42 Series. The reigning champions won the first race after leading round each mark, finished third in the second race and chased Quantum Racing (USA) across the finish line of the third contest for a second place. 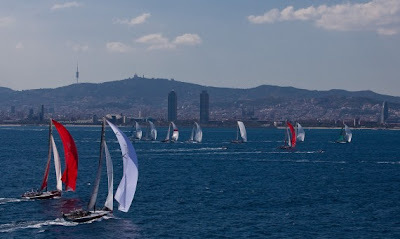 After a morning postponement ashore waiting for sufficient breeze to build, the Garbi sea breeze offered two excellent races under clear skies and sunshine with up to 17 knots of breeze before the wind backed to the left for the third race of a long day on the water. Quantum Racing and Emirates Team New Zealand (NZL) were best placed from the scrabble off the pin end of the line for the final race, fighting to get left. They were rewarded with first and second places as the 2008 champions held off the current Audi MedCup TP52 title holding Kiwis down the final run. Quantum Racing's 11,1,1 ironically fits the description of the type of inconsistency which skipper-helm Terry Hutchison (USA) recently described them trying to avoid, dropping them to third overall in the event, behind Artemis. Paul Cayard steered the Swedish flagged boat to 5,2,4 for the day to hold second place one point ahead of Quantum Racing. Pacing themselves nicely through a long day of delays, wind shifts and a slowly building breeze into the sunset, the Madrid - Caser Seguros (ESP) team led by helmsman Paolo Cian (ITA) has had another phenomenal day in the GP42 Series of the Audi MedCup on scores of 1-2-1 for the day. This has strengthened their lead to 6 points in the Camper Regatta - Conde de Godó Trophy – Barcelona over runner-up Islas Canarias Puerto Calero (ESP) led by skipper Jose Maria Ponce (ESP), but their lead has increased by only a mere point over the Canarias team near the halfway mark in the overall series scores. For tomorrow, three races for TP52 Series and two for GP42 Series are scheduled. First start of the day due at 1300hrs.